Truffles are a powerful ingredient. A little goes a long way, and that’s a good thing considering how expensive they are. An individual fresh black truffle typically costs over $100. Last week I performed a minor miracle when I made an incredible truffle butter chicken breast that tasted as though it had been marinating in a second mortgage amount of truffles. And it cost me less than for under $10. The source of all that intense flavor was just a pat of truffle butter bought at Whole Foods for $8.99, no doubt made from specks of discarded truffles. But I had a little help from a secret weapon: the Sous Vide Supreme demo unit I was trying out for a week. One of my favorite benefits of Sous Vide technology is how it intensifies the flavors of the spices that are vacuum sealed with the meat or fish it is cooking. Even dried and dusty supermarket herbs can taste magical after an hour or two in the Sous Vide water bath. 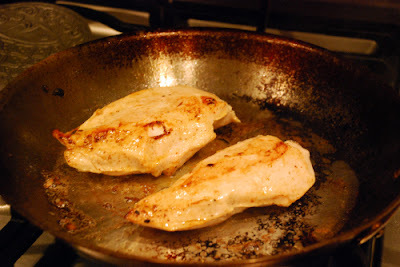 Although the recipe below is for truffle butter chicken, it could be used for any type of chicken dish in the sous vide machine. As time is not critical in sous vide cooking, the only important factor is temperature. Ten degrees can mean the difference between a pink center and a gray center. 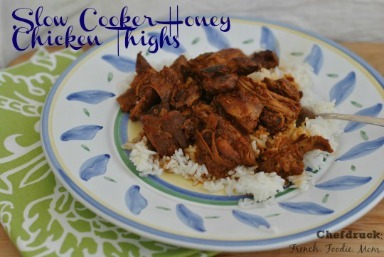 For white meat chicken, the target temperature is 140 to 146 degrees Fahrenheit. 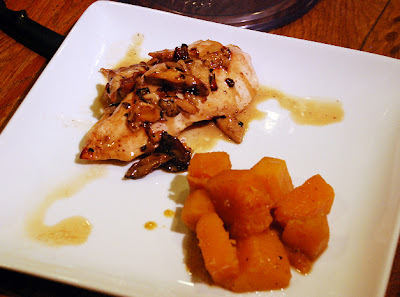 I topped the truffle butter chicken with a creamy shiitake sauce. Although the sauce was earthy and delicious, it didn’t mask the truffle flavor in the least. Each bite of the chicken was soft, tender, and exquisitely infused with the unique aroma of truffles. Set the Sous Vide machine to 140 degrees Fahrenheit. It may take up to 30 minutes for it to reach that temperature. Cut a flap halfway through each chicken breast. Lift the flap and place the pat of truffle butter under. Repeat for the other chicken breast. 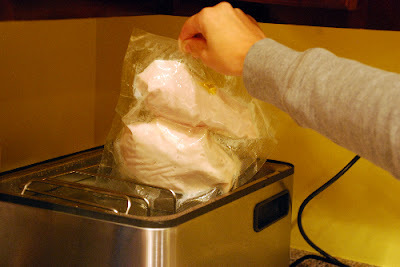 Vacuum seal the chicken breasts individually in a small BPA-free sous vide safe plastic bag. Place each bag in the sous vide machine. Cook for at least 45 minutes. Heat 1 tablespoon of vegetable oil in a large frying pan on high heat. Remove the chicken breasts from the sous vide and the vacuum sealed bags. Crisp them in the pan for 30 seconds on each side. Set aside. Add the salted butter to the large frying pan on medium heat. Add the shallots and the mushrooms and saute until soft and fragrant. Add the creme fraiche and stir well until boiling. Make sure you scrape up the browned bits from the bottom of the pan. Pour on top of the chicken breasts and serve immediately. 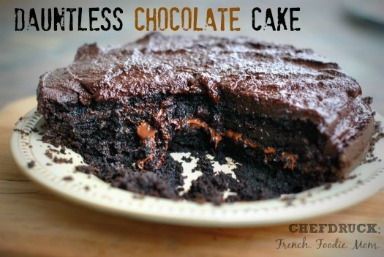 >This recipe sounds absolutely divine! I like how accessible the ingredients are. 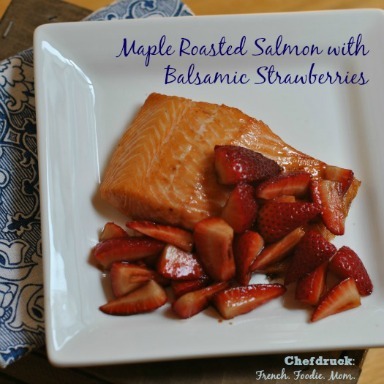 >This recipe and the photos are making my mouth water! I clicked over to the web site about the Sous Vide unit. I didn't know there was such a thing and am really interested in hearing more about it. Will you be posting a review? !